Check out Rhythm Of Rest! 1) In light of the New Covenant through Jesus, how are we to interpret and apply the Old Testament’s very serious command to “remember and keep the Sabbath”? 2) What is considered “work” to God? How do we know if we are being legalistic or obedient? 3) God gave some commentary regarding the Sabbath commandment. Is He intending to provide a deeper meaning of keeping the Sabbath, even before Christ provided us with forever rest in Heaven for eternity? Be careful to remember the Sabbath day, to keep it holy as the Lord your God has commanded you. 13 You are to labor six days and do all your work, 14 but the seventh day is a Sabbath to the Lord your God. Do not do any work—you, your son or daughter, your male or female slave, your ox or donkey, any of your livestock, or the resident alien who lives within your city gates, so that your male and female slaves may rest as you do. 15 Remember that you were a slave in the land of Egypt, and the Lord your God brought you out of there with a strong hand and an outstretched arm. That is why the Lord your God has commanded you to keep the Sabbath day. The command regarding Sabbath was repeated for emphasis throughout the Pentateuch, the first five books of the Old Testament. Exodus, Leviticus, Numbers and Deuteronomy all speak in serious language about the consequence of being “sabbath-breakers.” The law even held a death sentence for certain violators. As followers of the resurrected Christ, we now honor God and keep the sabbath by looking to how Jesus fulfilled it through His life and death. Although there were very specific guidelines in Old Testament Law, it seems very clear that the apostles specifically omitted dogmatic instruction about the observation of certain days to communicate a new kind of rest that had been instituted by Jesus. This is not an obligatory external rest – ceasing from work – but an internal rest that begins in and flows from the heart. The apostles told the believers to rely on their personal consciences, shaped by a desire to please God, when they were making decisions about work and rest. God gave two reasons in the Old Testament for establishing the Sabbath as a sacred day. One is specifically found in Genesis at creation (Genesis 2:3) and the other is specifically seen in the passage today. We learn in these passages that the Sabbath is for rest and for remembering. Even though the Old Testament command specifies a day (the seventh day), in the New Testament, Paul explains the Sabbath was a shadow of Christ and that the actual day itself had become insignificant. Christ established eternal rest – salvation – through His death on the cross. (www.gty.org) At the last supper with His disciples, Jesus invited them to remember a rescue they had not yet witnessed and most certainly did not grasp as Jesus prepared to give His life as a ransom from their sin and ours! At Mt. Sinai, where God gave the Law, God invited His people to remember a rescue they had witnessed as He had parted the waters of the Red Sea to allow them safe passage from the hands of the Egyptian slave masters. In verse 15, even in the observance of Sabbath, the story of redemption is woven through every part of Israel’s history. We remember the Sabbath by remembering the work of Christ on the cross where He took the punishment for our sin upon Himself. 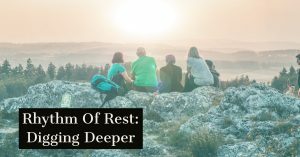 “Resting in” the work of Christ is not the same as “resting from” the work we do. But there is a connection. Although we are no longer slaves to the Law in the same way the Old Testament believers were, we are also no longer slaves to sin. We are now slaves to righteousness. It’s a new kind of slavery, and a new kind of rest. Our obedience is not a condition for salvation, but it is an evidence of it. We keep the Sabbath by making time in our days and weeks to focus on what has been done for us through Christ’s work. If we have been redeemed, we will make time to be free of distractions that keep our souls in turmoil. We will desire to make time to rest our minds and bodies, intentionally tuning our hearts to remember the amazing grace of God that rescued us from sin, death and the grave! God makes it clear in the New Testament (Romans and Hebrews especially) that Christ finished the work of sacrificing for our sins. There is no work to be done that would earn us a relationship with God or eternal life, but there is to be obedience, springing from a transformed heart. 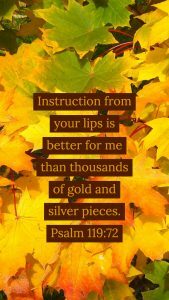 God’s word sometimes gives us specific instruction on how to live; other times it offers guiding principles that we must pray through, asking for wisdom to know how to apply it to different situations. Paul said in Philippians 2:13 that God is working in us the desire to do good works. Thankfully, the saving work has been done by the Lord Jesus. The sanctifying work happens day by day as we surrender to the Spirit of God, seeking to know Him deeply through His word and prayer, then resting in His power working in us to accomplish His purposes. Catch up with Rhythm Of Rest!